The modular design of the Contiplant system is based on Fluitec’s continuous mixer / heat exchangers. It allows each process to be developed quickly and precisely for the target product on a laboratory scale. Owing to the modular design of the Fluitec Contiplant system, it is now an easy matter to test the conversion from batch to continuous reaction processes and assess the economic impact. In many cases, significant business potential can be identified based on the higher concentrations, better temperature control or other process intensification measures. This potential can then be leveraged consistently when moving from the laboratory to the pilot plant due to the excellent heat transfer rate of the Fluitec Contiplant modules. The achievement of full modularity results in a shorter and more straightforward design phase. Optimised peripheral devices are essential for continuous reaction processes in the laboratory or in a pilot plant, to guarantee perfect control and monitoring of the reaction. The Contiplant series includes sensors, actuators and other peripherals specially developed for this purpose, which have no detrimental effects on the residence time range, heat transfer or mixing efficiency. Amongst other things, the Fluitec portfolio contains the specially developed high-speed premixer cooler Helix-Torpedo, injection valves, dosing points, rinsable sampling valves, various temperature sensors such as the axial multiple temperature sensor for process monitoring, pressure sensors with no dead spots, bursting discs, etc. Self-developed dosing systems and PLC with process visualisation complete the Fluitec Contiplant System. 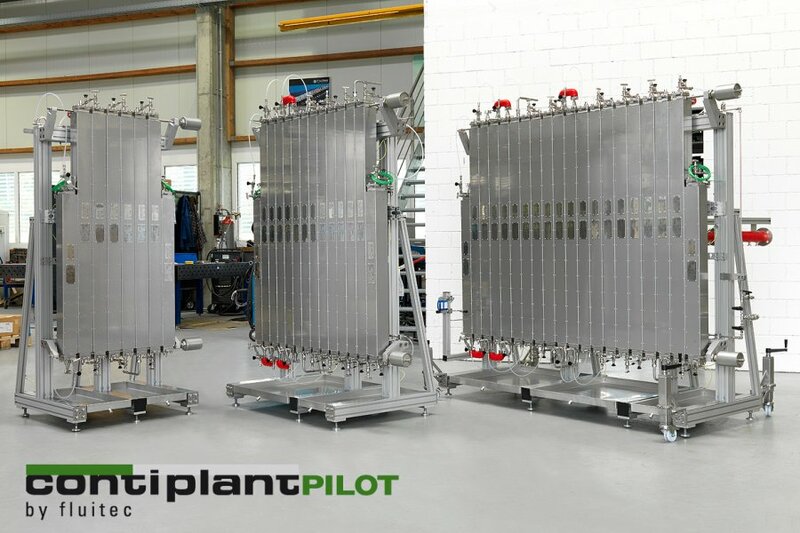 Fluitec mixer / heat exchangers can be scaled up accurately and are equally suited for laboratory equipment, pilot plants and full-scale production. Reaction systems can either be scaled up from a small plant or developed directly, depending on the process and procedure. Our mixer / heat exchangers can be scaled up easily and accurately because a constant surface-to-volume ratio is maintained regardless of the size of the apparatus. The design of the mixing elements is simultaneously adapted so that the local flow patterns – and hence the specific power – also remain constant. This is possible thanks to the various, complex mixer / heat exchanger generations. Apparatus of different sizes but with an identical surface-to-volume ratio are defined along the scale-up lines, so that precise scale-ups can be realised very simply. Fluitec designs, builds and manufactures reaction systems. As a result of our highly specific know-how in the field of static mixers and mixer / heat exchangers, we focus on those parts of the system where media are mixed, reactions controlled, temperatures set or narrow residence times maintained. 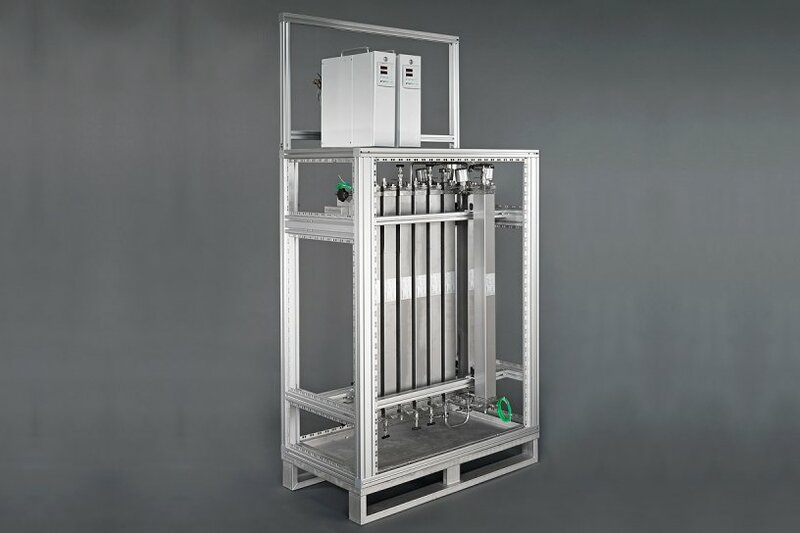 Apart from simple tube reactor systems, Fluitec can also offer combinations with other reactor or process apparatus such as loop systems, CSTR or agitators. Reaction systems in sterile design for the pharmaceutical, biotechnology or cosmetics industry are a speciality. Fluitec in-line reaction systems in sterile technology are used for high requirements regarding GMP, surface quality, CIP/SIP and FDA. If required, novel static mixing elements in polished design are used, which can be manufactured with high precision in the smallest nominal widths thanks to a manufacturing process developed in-house. Materials: 1.4435, 1.4435 BN2, 1.4404, Hastelloy C-22, or other high-alloy grades.